At 1pm on Monday, a family van parked outside the Science Museum in central London . Within two hours, as the family of four including eight-year-old Lucas and his younger sister Emilea returned from the nearby Natural History Museum, they found their windows had been smashed. There must have been a burglary, they thought; in fact, as they found later, their vehicle had been at the centre of a major security alert involving the bomb squad. 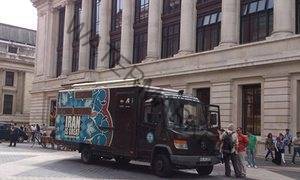 Counter-terrorism police had evacuated the museum and closed roads before breaking into the van, suspecting it contained a bomb. Instead, they found dolls and stationery scattered around inside. 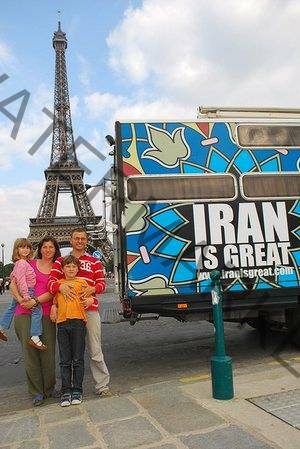 Cristian Ivan, the Romanian father, had no idea the big “Iran is Great” sign emblazoned on both sides of his van could cause such a commotion. Cristian, his French wife, Audrey, and German-born children had arrived a week earlier to participate in a festival in Wales, their first visit to the UK. In the five years since they started to live and travel in their van around the world, visiting museums has become an essential part of the home schooling of their kids. It was during a trip to Iran that they fell in love with the country and later decided to start their own campaign encouraging others to visit. Cristian particularly felt agitated that the police had not left any note behind, explaining what had happened. “I went to the police station and they accused me of provoking the whole thing, they wanted me to feel responsible for expressing my views about this country, Iran.” He has not received an apology. A >Metropolitan police spokeswoman told the Guardian on Thursday: “There was a security alert in the Kensington area on Monday as a result of a suspicious vehicle.” When pressed if the police has since apologised, the Met said it has not received an official request of such. The Ivan family began their new lifestyle five years ago. Cristian met Audrey in Germany where he was studying economics and then engineering. They made enough money to buy a house in Kassel, Germany, and later decided to rent it out to fund an adventure in their van across the globe. A monthly income of €2,000 has been more than enough. Their first destination was India but in order to get there overland they had to cross into Iran. They initially hesitated but then decided to go. What they saw there took them by surprise. What happened earlier this week in London was not the first incident involving their van. In 2013, while visiting Iran for the second time, they were actually robbed when staying in the city of Karaj, west of the capital, Tehran. Thieves took all their money and documents, including passports. Without them, they couldn’t leave the country.